Reducing and eliminating health problems caused by air pollution. Achieving and maintaining air quality standards for all criteria pollutants. Creating high-quality, relevant regulatory programs and ensure they comply with federal, state, and local laws. NOTE: Depending on the type of equipment, its installation or use may also require separate local jurisdictional permits. We have created a summary flowchart that shows the usual steps to be followed for the Air District permitting of an Emergency Standby Diesel Generator Set (the most common requirement that we have experienced with our clients and the BAAQMD) based on the Air District’s requirements and Skyline’s extensive experience with the installation and commissioning of this type of equipment. 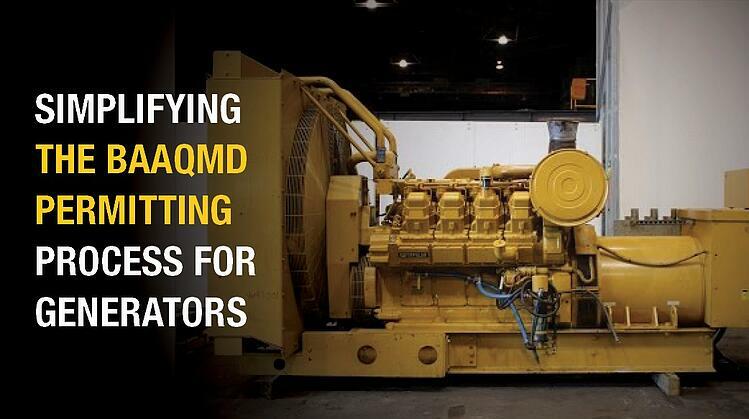 Depending on the other stationary equipment to be permitted, the steps, timing and application deliverables may vary. 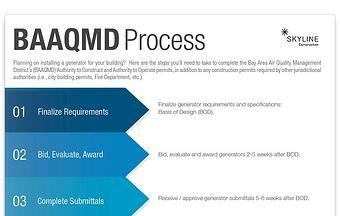 Although this infographic is a simplified depiction of the generator permit process, the application documents and process can be quite complicated. I you require assistance, our Skyline team can provide additional clarification to the permit process related to specific equipment installation or operation and can further explain the detailed BAAQMD application requirements (or any additional permit requirements from other parties) including Form P101-B “Authority to Construct/Permit to Operate; Location Map; Facility Map; HRSA Map; Form ICE Internal Combustion Engine; Form HRSA; Specific Generator Specifications based on actual engine to be used.